Today it is blowing a gale. There was snow on the rooftops when I got up but we haven't had any since. I hope that is the lot for now. I took this photo the other day. It does make me giggle. There you can see Merv in his front garden. Look how pristine his lawn is. Not a leaf in sight. Aha.......but look at next door's lawn. Right.......you can't even see it because it is almost knee deep in leaves. This drives poor Merv nuts, because the leaves keep blowing back over to his lawn. I actually wonder if his neighbour does this on purpose. Today Merv is probably inside having a meltdown because the wind is so strong it is whipping all the leaves up and sending them hither and thither. No chance of sweeping any up today. Most of the ones left in the trees will probably be down by tonight. Looby Loo is so excited by all the leaves whizzing past our windows. I don't think Merv will be very excited. Poor Merv......never mind.......he can start looking after his 'hole' soon. This is a painting Lauren did. Pretty good isn't it. She says it is one of her favourite musicians but I can't remember who she said. I love it and brought it back with me. Today I framed it and put it on the wall. She has developed quite a style. Don't you just love phrases like 'hither and thither' ? So glad I managed to squeeze that in. My back is improving.....slowly....but improvement is good. I have been very careful this week and, although not be able to go out isn't great, I am hoping that it will have improved enough for me to go out next week. 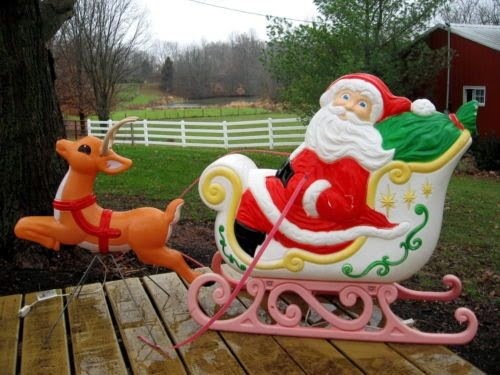 Philip bought the above Santa, sleigh and reindeer a few days ago. It is really old fashioned but we have be wanting one for years. Well, Mennards had a couple so now it is sitting in our garage waiting to go in the garden. It is lighted too ........I think it is fab. It won't be long now before we will be putting our lights, decorations and ornaments outside. The first snowfall of the season is forecast for Friday. This is a bit of a shame really. It is Halloween and although we already had our city Trick or Treat day on Sunday, others still do it on 31st Oct - Friday. Our neighbourhood association has a Trick or Treat event organised for Friday evening and apart from snow it is meant to be very windy and cold. The weatherman said it would be the worst weather for Halloween in 20 years. Those kids will be freezing. This year has flown by - again. I shall soon be making the Christmas cake and pudding. We will soon be back to shovelling snow, buying a tree and putting decorations up. It only seems a few weeks ago we took them down. Well, to be fair, our outside decorations were outside until Easter this year as the winter went on forever and the ground was too frozen to get the stakes out. I had thought about putting Easter Eggs in the sleigh we had out there. So, it wasn't that long ago we took them down but it also doesn't seem that long ago we put them up. But, I love Christmas so I really don't mind. I have designed and ordered my Christmas cards online this year. Usually I do a festive (ish) painting and then bugger about printing the cards myself ( or rather Philip tends to do the printing - well it gives him something to swear about). It is a pain in the arse as the printer doesn't like card that is too stiff. This means I have to buy fairly thin card and I am never really happy with the result. This time I am having them printed, from a painting, by vistaprint. I agonized over proof reading them a million times because I didn't want to order 50 cards only to find a glaring typo in them all. They are due to arrive on November 4th.........I am sort of scared and excited at the same time. I do hope they look alright. If you get a card from me and it has a big scribble on it........you will know I buggered it up. Sunday was Trick or Treat day. I usually love this day. 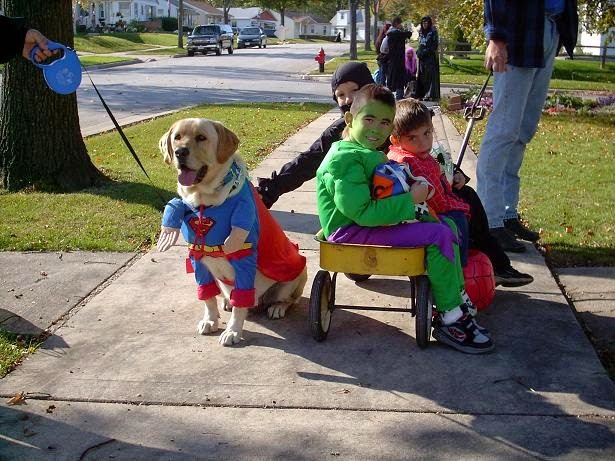 I love seeing all the kids, and dogs, in their fancy dress. This time I was dreading it. We had bought lots of sweeties to give out, as usual, but my back has been very painful (excruciating) these last few days and I was not looking forward to getting up and down to answer the door. Philip was outside leaf blowing, more of that in the next blog - Merv isn't happy. I put Mountain Monsters on the telly. They always make me smile. They were after Sheepsquatch this time. A fearsome beast if ever there was one. The weather was beautiful. Bright, sunny and mild. But, fortunately for me, we didn't get so many kids this time. I suppose we may have got 50 or so but that is nothing compared to most years. I did struggle to get out of the chair and get to the door though. Philip had suggested I didn't do it at all but, oh, you know what I am like with kids. The rule is that if your porch light is on then it means they should knock at your door. They are so good. They never knock at any house where the light isn't on. Even with our light on though, I noticed some were walking past without knocking. They didn't seem to notice it. Usually I would have tapped on the window and called them back but, sadly, this time I just couldn't be bothered to get up if I didn't have to. If they can't see the porch light then I am not jumping (creaking) up to give them sweeties. There was one Harry Potter though. Their faces are a picture when I put on my best, British, School Ma'am voice and ask Harry Potter what he has been up to and why he is out of lessons? I think this back issue is due to the overly long flight back from England. I have one vertebrae, quite low down, that is extremely tender to touch. The pain seems to radiate from there into my lower back, hips and down my legs. I have had this before (now I've got it again) and I know that only rest and ibuprofen will cure it. It is the 'rest' part I have a problem with. The weather is glorious (soon it won't be) and I like to get out and about. Staying indoors and doing practically nothing does not make me happy. I have to give in to it though or I will be like this for weeks. We were going to go out for dinner on Saturday evening but I was in so much pain that just walking to the car was more than I was prepared to do. I am not as bad as that now so it must be getting better, very slowly, but better none the less. Anyway, it hurts when I am sitting in this chair so it is tatty bye for now. England trip - The Sequel. Lauren loved the Batman onesie we bought her. Apparently it is really cool to like Batman. TommyJones seems to like it too. Donna's other cat, Little Elsie, liked the catnip toy I bought her. Everyone was happy then. The end of my trip was approaching but couldn't be over without a visit from The Essex Massive. I didn't manage to get photos of them all, but we had such a lovely time. It was the first time they had been to Donna's house. Lots of laughs again, which was great. John tried to get left behind when they had to leave (he is the one in the middle) but we noticed and threw him out. I got very tearful this time when I had to leave for home. I don't know why really but it seemed even more difficult than usual. Donna took me to the hotel at Heathrow on Sunday. I stayed overnight and flew back on Monday. The flight took longer than usual - 9 hours - which was, apparently, due to strong headwinds. I had Hurricane Gonzalo to thank for that. Well what was left of him. Still, I shall not complain too much as some flights out of Heathrow were cancelled the following day due to the remnants of Gonzalo. It is good to be back. It is cold though. Heavy frost this morning and I noticed they have started building the road salt mountains in the car park at the mall. My English excursion has flown by once again. At least I didn't get poorly while I was there this time. Above are a couple of reprobates - I mean colleagues - with whom I worked, at a certain academic establishment. It seems a long time ago now, but then actually it is. It was lovely to see them and catch up on some, if not all, of the gossip. I managed to get three Sunday pub lunches in this time. Sorry if seeing people's food offends anyone, but this is such a treat for me. Unavailable over here. I also got to meet TommyJones! Donna's new kitty that she adopted from a place Glenn was living. He is an absolute delight. Such a little character. He loves everyone and my toast. He must be missing me and my toast right now. He didn't seem impressed with having his photo taken though. Glenn and I met up with my father in law in Canterbury. A lovely lunch followed by a mix up with the money made for an eventful day. I got it all sorted in the end though. It was lovely to see him and his partner. A lot of laughs and silliness. Loved it. Donna and I were having coffee with these two old chums when who should walk by? I will never forgive you Bernie for scaring the bejeebers out of me at The Alien Experience (I think that is what it was called) in London many moons ago. Remember mate, salad....oops I mean revenge....is a dish best served cold. Of course no trip would be complete without harrassing Fred - another former partner in crime, also from the afor mentioned workplace. He never looks any older!!!! Another couple of chums who had recently returned from a holiday in Turkey....looking disgracefully fit and well. We had a lot of laughs with these two. Lauren gave us a guitar recital too. She is getting bloody good. A second trip to Canterbury was wonderful. Lots of tudor buildings housing fab shops. I bought one or two things here (!) to bring back with me. Our next trip out after Canterbury was to London. To the Natural Histoy Museum in fact. I hadn't been there in years. The last time I went - I think I took a school trip of kids there. That would be some time ago. It is still fantastic. We went up on the fast train, which only took 35 mins from Ashford to St. Pancras. That was amazing in itself. We got the underground to South Kensington and to the museum. It is still FREE to go in. We were there most of the day and probably saw about a third of it. Totally exhausted we made our way home. The whole place is huge. Lauren loved it. Even punk rockers like museums. I went to Folkestone a couple of times and managed to see the "Banksy" that had appeared on a wall there shortly after I arrived. A "Banksy"......shortly after I got there.......I wonder who can be doing this? I also had lunch in Wetherspoons while I was in Folkestone. I love this Wetherspoons. It used to be a large old church and they have preserved it wonderfully. The one I went to in Whitstable a couple of years ago, is in a former Art Deco cinema. That too, is beautiful. I will continue on another blog page as this one seems to be full.